I can't find the answer to my question here. What should I do next? Why should I select Touchstone for my US military document research and retrieval needs? How can I check the status of my Express Service case? I purchased your Guided Service, but I still haven't received my record from the facility. How can I check on its status? How quickly can I get my DD214 with your Express Service? How does your Guarantee that "No One Can Get You Your Military Records Faster!" work? How can Touchstone obtain a copy of my record faster than if I were to submit to the Government directly? I've already ordered my DD214 from the Government. I've now waited weeks and it still has not arrived. Can I order it from you? Can I get a copy of Member 4? Can I get a deleted DD214, the short form? Can I get a DD214 for my Reserve Service? I have read you don't get a DD214 for reserve service. What do I need to establish eligibility for a VA Home Loan guarantee? Can I get a replacement DD256 (the Wall Certificate)? Will I get a refund if you cannot find my record? Who can obtain a copy of a veteran's DD214? What do I do if I'm having some technical problems accessing my account, or downloading my record? What is an OMPF (201 File)? What is a Certification of Military Service, and why did I receive that instead of my DD214? Can I access my DD214 Online? Can you tell me if your VetRecs ID cards will allow veterans onto the bases, PX, and commissary? How does Touchstone secure my personal information? The copy quality is very poor. How can I get a better quality copy of my record? I separated before 1950 and have my separation documents. Do I need a DD214 too? Why haven't I received any email account notices, case updates, etc. from you? How can I upgrade my discharge from Less Than Honorable to Honorable? My DD214 is incomplete/inaccurate. It doesn't contain important information, and needs to be updated. What can I do? Do active duty personnel who perish during active duty receive a DD214? For both efficiency and convenience, we encourage you to first use our online support resources available at our website: you can check the status of your case online by logging into your account at our website, the My Account link in the upper right hand corner, then going to your Order page where you will find our case notes and comments. Although we recognize that each case is unique, our website’s Support Center, Help Desk, Frequently Asked Questions and online Support Ticket System – all provide additional resources to answer the most common questions, and to allow us to investigate any particular issue more closely. If you have a question not answered here, please open a Support Ticket from the above menu (login to your account is required). The Touchstone support team monitors new posts and are on hand to provide their expertise, and if necessary, investigate your issue more closely. They respond to most tickets within 48 hours. We add to this FAQ, too, primarily from the questions posed to us through our Support Ticket System. So, your question may help us to help other clients as well. Touchstone opened in 2006; we’ve been in business longer than any of our competitors (check domain registrations, and the Internet Wayback Machine). In the passing years, other military record “expeditors” have come and gone while Touchstone has thrived. Touchstone completes more record requests per unit time than all of our competitors combined. We have completed over 50,000 requests, from E1s to one or two O8s, that’s Privates to Generals for the layperson. These veterans know how the Government works and whom to go to for their records. Our positive reviews which you can read at our website, are legion. Our business from our client referrals, alone, exceeds any one of our competitors total business. Why have we grown to this pre-eminent position? Simply stated: no one knows more about military records, and no one can get you your record faster! Why? The majority of our researchers are former federal military records center personnel, and base spouses, which gives us unsurpassed and unprecedented access to military records centers, several of which are on bases closed-to-public-access. You can log into your account 24/7 through the My Account link at the top right of this page. Once you log in, you'll see your case's complete list of annotations/comments detailing when we received your Request Form, when your Request Form is assigned to a researcher, the researcher's name and location, and any reassignment - in general, a step-by-step listing of the progress we've made on your case. Whenever we add an annotation or comment to your case, we'll also send you an email update with that annotation/comment. Preparing - You have set up your account, but we have not yet received payment. Processing - Your case has been assigned to a researcher and submitted to the appropriate Record's facility(ies). Delivered - Your record is immediately available for download and has been shipped. Your shipping details are also provided so that you can one-click and track your hardcopy shipment. You may still have questions as a result of problems with your particular case. Remember, all cases are unique. Military record keeping is not always consistent, and not always thorough. If you have issues not addressed in your case's annotations or answered within our FAQ, or you have a comment or concern about your general experience with Touchstone - we are always striving to improve - please open a Support Ticket from the above menu. Please give us 48 hours to respond so that we may review your case, make the appropriate inquiries, and provide a hopefully thoughtful and thorough response. Unlike our Express Service, where we assign a researcher and submit your request to the facility as your agent and they deliver the record to us, with our Guided Service we submit your request to the Government and THEY do all the processing. Government record facilities may take several weeks or longer to deliver you your record. Pursuant to the provisions of the Privacy Act of 1974 (Public Law 93-579), Government records repositories cannot release personal information without the prior written consent of the individual to whom those records relate. Consequently, unlike our Express Service where we act on your behalf as your agent, an employee of Touchstone cannot discuss the details of your Request with the Government records repository under our Guided Service. Therefore, after Touchstone has submitted your Request, you must undertake any follow-up or status check directly with the facility(ies) itself/themselves. "Once you have allowed sufficient time for us to receive and process your request (about 10 days), you may check the status of your request by e-mail through our NPRC Customer Service Center at https://www.archives.gov/st-louis/forms. Please provide the request number if you have one, the name, address and phone number of the requester, and the veteran's branch of service to aid us to finding your request in our system. You will receive a return e-mail from us with a projected completion date for your request. This number will allow you to hold until a technician is available to help you." Your records will be kept at one or more of well over 100 different government records repositories, each of which will have its own processing procedure - and processing times. The time in which the Government will provide our on-premises researchers with your "chart" will vary from facility to facility. We can obtain many records the same day. (Same Day - our receipt of your Request Form by 10 am Eastern.) But some facilities will require a little more time. However, in well over 95% of cases, we will deliver a certified copy of your DD214 to you within 7 business days. One difference in records facilities which will affect the amount of time in which your record is returned is the type of record maintained by that facility. More recent military records (generally from about 1995 and forward - but will vary by branch of service. See chart below.) are kept in digital format and these facilities can generally return the record to our researchers same day. All we need is access to a computer at the facility, and the record can be accessed by any number of persons simultaneously. Older records are kept in physical format, i.e. paper, microfilm and microfiche. The request has to first be entered into the Government's computer system, and then a "puller" assigned to retrieve the record off the shelf. Depending on how quickly the request can be entered into the system (are there few or a lot of requests to be entered that day), the efficiency of the data entry clerk, how quickly a "puller" is assigned to retrieve the record, the "puller's" workload and efficiency, the record's physical location within the facility, and how thick the chart in which to manually locate the separation document, and then to copy it - all are variables that will effect retrieval times. And, since only one person can access one physical record at one time, if the record is off the shelf, it cannot be accessed until its return. For records facilities which hold records in physical format, they will prioritize requests based on exigent circumstances, emergencies, etc. Funeral requests, for example, can be fulfilled generally same day (if submitted before 10 am Eastern), sometimes next day. You should indicate any immediate need on your Request Form for the Government's consideration. You should take these Government internal delays into consideration when you place your order. Please check the chart of typical facility delays below. If you had a Service/Serial Number as your military ID, rather than your Social Security Number, and did not provide it, this will sometimes delay our retrieval of your record. Social Security Numbers began their use as military ID only in the late 1960s to early 1970s. If you had a Service/Serial Number as your military ID, generally there is no cross-reference from your Social Security Number. A Service/Serial Number becomes particularly important when your surname is not uncommon. A Service/Serial Number number will greatly increase the likelihood of a successful record retrieval. The NPRC, the single largest records repository, suffered a catastrophic fire in 1973. For more on the fire, visit: http://dd214.us/nprc_73fire.html. If your record was affected by the fire, additional time will most likely be required to locate your record, if it can be found at all. If your record cannot be found, NPRC will attempt to do a reconstruction of your record based on other available sources - all of which will add time to your record's retrieval. If your record is at NPRC, a physical record facility (generally pre-1995 separations), if you've placed a prior order with that facility, the retrieval of your record will most likely be delayed. Your record is then pulled off the shelf making it inaccessible to us until its return. After the NPRC has finished with the chart, it will be placed in a re-shelving area where it may languish another week or two before we can access it. Again, for records at NPRC, a government agency may have requested the chart. If the you have filed a VA claim, for example, the chart may have been pulled. Again, we can't access the record until it is re-shelved. The information provided to us by you may have been incomplete and/or incorrect. Remember, each request is unique. The facility delays available at the chart above are averages and based on our experience with each facility. All things being equal, we guarantee that no one can get you your record faster! Our processing day cutoff for all requests is 10 am Eastern. Requests received before that time will be assigned to a researcher and submitted to the appropriate records facility that day. When you order our Same Day, Next Day, Three or Seven Day service, that is the time in which you are allowing us to submit your request. You should add any facility delay to our time in order to determine approximately when your record download will be available, and add further your shipping method's time to determine when you'll receive your hardcopies. For example, here's the optimal delivery: you order Same Day Service, we receive your Request Form before 10 am Eastern, and your record is at a digital records facility (where the facility will make your record available to us within hours), you'll have your record that same day. However, if your record is at the NPRC (a physical records facility), although we do get some records there same day, most come in 2-4 days on average from that facility. So that facility delay should be added to the service you've selected. The day we submit your request to the facility is Day Zero. The next day is Day One, and so on. Only business days are counted, days the records facilities are open and available to process requests. If you acquire your record independently, not as a result of our efforts, ordering it from the Government or another company AFTER having placed your order with us AND receiving it before we can deliver the record to you, we will provide you with a full refund. If, however, you order your record from the Government or some other company BEFORE placing your order with us, and that record comes in first - that earlier order had a head-start; it wouldn't be a fair race, so our guarantee wouldn't apply. In fact, an earlier request placed with the Government may actually hinder our ability to get you your record quickly (see FAQ No. 9, below). Also, you must apply for this refund BEFORE we deliver to you your record. Our Guarantee applies only to records which are in existence. If your record was created by the Government AFTER you had placed your order with us, we cannot be expected to retrieve a record which was not even in existence at the time you placed your order. In order to qualify, you would simply have to provide a copy of your record and the details of your acquisition - when and with whom did you request your record and when did you receive it, and we'll then confirm. This information allows us to improve our service, so a refund, once we have the details, is an investment for us. First, you have to know which records facility will maintain your record. Your record may be held at any one or more of more than a hundred different records centers. Then, you can mail or fax your request to the correct facility, OR you can submit your request in-person to the facility's on-site customer service window. The records facility will ALWAYS respond faster to requests which are physically submitted to it in person than to requests it receives by mail or fax. The difference in response times can be as little as days to as much as weeks, or even months. In brief, Touchstone has researchers at all of the major records repositories, nationwide, who will submit your request on your behalf in-person. We act as your agent, as if you yourself were there in-person, to request your record. Your DD214 is perhaps the most important document you can acquire. It substantiates your military service and is used to establish your eligibility for benefits such as VA Home Loans, tuition assistance, VA medical care, employment preference, retirement, spousal benefits, additional Social Security payments, membership in veterans' organizations, and many others. The term "DD-214" is often used generically to mean "separation papers" or "discharge papers," no matter what form number was used to document active duty military service. The term has, also, a specific technical meaning: it is a Report of Separation from Active Duty. For non-active duty, Reservists are issued either an Order of Separation or a Letter of Separation. The NGB22 is the standard National Guard separation document. The report of separation form issued in most recent years for separations from active duty is the DD Form 214, Certificate of Release or Discharge from Active Duty. Before January 1, 1950 (the creation of the Department of Defense, August 10, 1949), several similar forms were used by the military services to denote military separations including the WD AGO 53, WD AGO 55, WD AGO 53-55, NAVPERS 553, NAVMC 78PD, and the NAVCG 553. WD - War Department. AGO - Adjutant General's Office. NAVPERS - Navy Personnel. NAVMC - Navy - Marine Corps. NAVCG - Navy - Coast Guard. This applies ONLY to generally older records (about pre-1995, but varies with service branch) held at the National Personnel Records Center (NPRC), St. Louis - more recent separations with records at digital facilities are unaffected by a prior request. If you have come to our site out of frustration because you ordered your DD214 from the government weeks or even months ago and you still haven't received it, PLEASE DO NOT try to order it from us now. You have only one chart. Once the government receives your order, at some stage they will remove your chart from the shelf. Your chart then becomes inaccessible to anyone else until its return - which could be additional weeks later. In other words, once you've made your decision to acquire your DD214 from the government, you will most likely not be able to later change your mind and expedite the order through us - unless you want to gamble that we can still get to your chart before the government. If you'd like to take the risk, fine. However, even only a day or two's prior submission may cause the record to be pulled from NPRC's shelves - then it will sit on some clerk's desk until processed - making it unavailable to us until its return to the shelf. We get this all the time. There are eight (8) original DD214s. Member 1 (the short or deleted form) and Member 4 (the long or undeleted form) are offered to the service member at separation. Generally, once they are issued, they are gone forever. If the service member requires another copy, then he/she can acquire a copy of only one of the other remaining originals, usually a copy of the original maintained by the service branch itself, usually a copy of Service 2, Service 7 or Service 8. Rarely will the service branch keep a Member 4 or Member 1 copy, since they have their own copies. If it's there, that's the copy we'll provide. All of the eight original DD214s are identical, except for Member 1 - the "short" or "deleted" form. The remaining seven long forms includes another 1.5 inches at the bottom which provides information concerning the service member's characterization of service, narrative reason for separation, legal reference (authority) for separation, separation and re-entry codes. The short form does NOT contain this important information - hence employers want the long form (which are all identical original DD214s EXCEPT for Member 1). Anyone who has worked with DD214 for any appreciable amount of time knows this. If a member loses his Member 4 for whatever reason, or never received it in the first place, what is he to do? Well, he comes to us and we get him a certified copy of one of the other remaining originals. These copies have the full legal force and effect as the original Member 4. The only difference between the undeleted and deleted version of DD214 is the bottom 1.5 inches of the long form. The DD214 is designed so that all you have to do is move that section, the bottom 1.5 inches, off the copier (or cover it over with a blank piece of paper) - and you have the deleted DD214 (the short form). Be forewarned, though. Any employer who is familiar with DD214 will always request the undeleted report of separation (the long form). If you give them the deleted version, that will suggest that you are trying to hide something. If you do have something that you may wish wasn't noted, generally you'll be better off explaining the situation rather than trying to conceal it. "The term "Military Services," as used here, refers to DODI 1336.1, January 6, 1989 2 the Army, Navy, the Air Force, the Marine Corps and, by agreement with the Department of Transportation, to the Coast Guard." DD214s are NOT issued, generally, for separations for reserve service. Different branches of the military reserves issue separation documents that are titled something other than DD-214. Reserve separation documents are commonly in the form of either Orders of Separation or a Letter of Separation. The USMCR will issue a Points Summary to substantiate service. National Guard separation documents are called NGB22. Our researchers will retrieve your chart and copy and ship ALL separation documents found therein. You should make sure you request a Points Summary, Retirement Points Summary, which, assuming you've accumulated sufficient points, will establish your eligibility for the VA Home Loan guarantee program. When you indicate that you need your reserve separation documents for a VA loan, we'll automatically request a points summary for you. You might consider your DD256 as your Diploma, the item that you frame and hang on your wall, and your DD214 as your transcript - the document that indicates in greater detail what you've achieved in your military career. The DD256s (the wall certificates) are no longer re-issued by the military. However, if you never received your Discharge Certificate, it may be located within your 201 file. Originally your Discharge Certificate was mailed to you at your Home of Record. If the Post Office returned it, then the military may retire it, placing it with your personnel file. If you place an order for a DD214, or a copy of your complete file, we will also automatically send you your original Discharge Certificate, if it is within your file. Unlike a DD214, the DD256 has no legal authority; good reproductions can be purchased on the Net (with anyone's name on them) through commercial re-sellers. We are the largest commercial expediter of military records, retrieving more records per week than all of our competitors combined. It is very rare that we cannot locate a record. One of our competitors advertises a Money Back Guarantee if they cannot locate your record within 7 days. However, not all records are at the National Personnel Records Center (NPRC) in St. Louis. We have researchers at numerous facilities nationwide. We even go to the unit level, if necessary, to retrieve a record. And, when we determine that a DD214 was lost by the NPRC or military branch (more common than you would think) or never created in the first place (ditto), we will assist you in the administrative process to have your record re-created. Will our competitors do the necessary work to acquire your DD214 after they have given you a refund? Unlikely. Ultimately, which would you prefer, your money back or your record? Your record can be at located at any one or more of more than a hundred Federal and State records repositories. However, your Official Military Personnel File will be filed at a specific repository based on your service branch and date of separation. If we locate your OMPF and no separation document can be found within it, we cannot retrieve a document which is not in your chart. Nor can we guess as to why it is not there. Nor can we create an official document. In this case, we will advise you on the method that you are required by law to use in order to have your DD214 administratively re-created. It is even more rare that we cannot locate any record whatsoever for a client. In brief, we actually exert more time, effort and expense in attempting to locate records which are not where they should be, or that are missing key documents - than we use in standard requests where the record is easily found and it contains the requested documents. So, unfortunately, a refund is not possible. There is, however, one exception: if your record exists and you can acquire your record but we couldn't, we do GUARANTEE that "No one can get you your military record faster!" See how our guarantee works, FAQ No. 6, above. A veteran's military records are protected by the Privacy Act of 1974, 5 U.S.C. Â§ 552a (the Privacy Act or the Act). During the veteran's lifetime, only the veteran can access his or her records - unless, of course, you have a Power of Attorney, Legal Guardianship, Executorship or other legal appointment. If the veteran is deceased, then the law permits the next-of-kin to access the veteran's records. Next-of-kin is statutorily defined as father, mother, brother, sister, son, daughter or un-remarried surviving spouse. You will also have to provide proof of death such as a copy of the death certificate, an obituary or a letter from your funeral director. If you are not the next of kin of a deceased veteran, or the veteran him/herself, you can still obtain certain information concerning a veteran through our Freedom Of Information Act (FOIA) service. If the separation occurred more than 62 years ago, the record falls into the public domain and no specific permission is required in order to access the record. However, even if a file meets archival dates, if the record is to be used for "Benefits", the signature of the next-of-kin will be required. Usernames and passwords are cASe SensITIve, a mix of BIG and small letters that must match exactly. A Copy and Paste will usually correct any error. Your username is your e-mail address including the @domain.com part, all lower case. If you've forgotten your password, you can use the forgotten password feature and our system will send you a new password. At Previous Orders, click View order. On your Invoice page, you'll see a section Download Links. Once opened, click first the Disk icon at the top of the page to Save the image to your computer (remember where on your computer you save the PDF file), AND then click the Printer icon to print out a hard copy. If you receive an error along the lines: the file is damaged and irreparable, you are most likely using an older version of Adobe Reader and should upgrade. See the Adobe Reader link above. If all else fails, we can fax you a copy and, of course, you can expect your hardcopy shipment soon. The Official Military Personnel Files held by the Government, sometimes referred to as a 201 File or OMPF, hold the stories of millions of individuals who defended our nation throughout the many wars of the 20th century. The army calls its OMPF folder Form 201, which is now the popular term for all military personnel folders - "the 201 file." The most common OMPF container is a stiff 12-by-9Â½-inch brown file folder. Many of the folders from the past quarter-century contain microfiche images of the personnel documents that were sent to NPRC either in place of the original paper records or with them. OMPFs held by NPRC, a physical records facility, reside in hundreds of thousands of cubic-foot cardboard boxes on 11-foot-high shelves in immense storage areas. OMPFs will vary widely in their contents, sometimes containing information in minutia, other-times missing vital documents. It may contain medical records such as physical evaluations and outpatient records. It may also contain personal information such as home of record, and awards documents. They typically contain such documents as enlistment contracts, duty locations, performance evaluations, award citations, training records, and the especially important Report of Separation (DD Form 214 or earlier equivalent). A typical U.S. Air Force OMPF from recent years. Your OMPF is an important document for former service members to maintain, as the documents contained within it are important for access to benefits such as the VA Loan and the GI Bill. The Certification of Military Service (NA Form 13038) is a legally valid equivalent and a perfect legal substitute for DD214 - for all purposes. On July 12, 1973, a disastrous fire at NPRC (MPR) destroyed approximately 16-18 million Official Military Personnel Files. The affected record collections are described below. Your records may have been included in the affected group. NPRC will also issue a Certification of Military Service whenever the original record - for whatever reason - is unavailable or unusable and when the veteran's basic service information can be verified through other official sources. In such circumstances, NPRC will issue the Certification of Military Service - the document which we provided. Your DD214 is NOT a "public record," and therefore it is NOT available through any public records search, service or database. Your DD214 is a private record, protected by the Privacy Act. As such, the facility which holds your record will REQUIRE your written authorization before releasing this document. Unfortunately, the online "public" records search database services fail to make this fact clear, and you'll pay them for a service which cannot access or acquire your DD214 for you. But, once we have your signed Request Form and retrieve your record, we'll make your record available to you for download from our secure server - and ship you two certified hardcopies as well. No. The VetRecs Card will only substantiate service, but it is not authorized for use as an access card to military facilities. Presentation of a VetRecs Card will have the same affect as presenting your DD214 (since we provide you with a certified copy of your DD214 as well). So, wherever you could use your DD214, the VetRec Card should work as an equivalent. As a backup, you still have your certified DD214 to use. The VetRecs Card is widely accepted to entitle veterans to various retailer discounts; but, again, you will always have your DD214 as backup. Acceptance, of course, is always up to the individual merchant or retailer. Identity theft is when your personal information is stolen and used illegally, to open accounts in your name. According to the Federal Trade Commission, identity theft is one of the fastest growing crimes in America. We know you have questions about how, internally, we keep your information safe. After all, weâ€™re requesting your most personal information including your Social Security number. We understand, too, that completing an online transaction requires a great deal of trust. We take this trust very seriously and make it our highest priority to ensure the security and confidentiality of the information you provide. Touchstone uses industry-standard SSL (secure socket layer) technology to protect every interaction you have with us. For example, when we make your record available online, it is available only from our secure server for your download. Our competitors say theyâ€™ll email you your documents; we would NEVER send your information over the Internet in an unencrypted form. This is just one example of how we go the extra measure to protect your personal information. Touchstone also uses strict physical, electronic and managerial procedures to safeguard the confidentiality and security of the Personal Information you provide to us. Touchstone is certified compliant under the Payment Card Industryâ€™s Data Security Standards, and is tested daily for security vulnerabilities by ConrolScan. We conduct background checks on all of our employees. Your personal information is stored on our servers and heavily guarded, both physically and electronically. All data is stored offsite in a secure data center. All of our facilities are built with the latest biometric security access as well as state-of-the-art surveillance and alarm systems. To further shield your information, we do not directly connect our firewall-protected servers to the internet. Several of our competitors claim that they use PayPal as their credit card processor for â€œyourâ€� security. While we, too, accept PayPal payments, we can also process your payment directly and securely through our own merchant account. Almost anyone can establish a PayPal account, but the standard of credit-worthiness, reputation and trust is much greater in order to establish a merchant account. Furthermore, your transactions with Touchstone are Bonded and Insured through BuySafe. BuySafe provides, also, an identity theft program as a part of your purchase â€“ to further ease your concerns. None of our competitors offers this level of protection. Finally, Touchstone processes more military record requests per week than all of our competitors combined. We have grown through our care and concern for our clients, satisfying our clientsâ€™ needs for the security of their personal information, and the efficient, expeditious delivery of their military records. We not infrequently get comments regarding the quality of the copies, particularly for older separations. For older separations, the government has microfilmed/microfiched the original documents. We copy off that copy. If the quality of microfilm/microfiche is poor, the copy will be exact - a precise copy of a poor microfilm/microfiche. Since we cannot improve the original, you are getting the best available copy. The NPRC is well aware of this issue but has no control over the quality of the documents provided to them by the military branches. The fact that they have certified your copies attests to the fact that they are, indeed, the best available copies. However, if the copies are entirely unusable for a particular purpose - and some records will qualify, you will have to write a letter to the NPRC and explain the issue. They have the capacity to make an administrative correction, generally issuing a Certification of Military Service which will substantiate only your dates of service and characterization of service. A veteran's OMPF is the foundation for ANY research. OMPFs contain a wide range of data, but will vary considerably in their contents. This is the first place one would look for any Veteran's history. If the record the veteran seeks is there, no additional research need be done. If additional research is required, the OMPF may provide the tools to conduct that additional research. For any military veteran research, it is the source which must first be examined. We can review morning reports, unit histories and diaries, and other sources depending on the nature of the inquiry, but that is custom research. We charge $65/hour, and generally 5-6 hours is needed for most cases. But, as in all research, no guarantees can ever be given for a successful result. We are paid to search, with the hope that we may find. For custom research, we bill in 3 hour increments in advance, with an initial $200 retainer. This service can be ordered online at our website, or through one of our Client Services Representatives at 800-At-DD214 (800-283-3214). "DD" in DD214 stands for Department of Defense. The DoD was created in 1949. Before January 1, 1950, several similar separation forms were used by the military services, including the WD AGO 53, WD AGO 55, WD AGO 53-55, NAVPERS 553, NAVMC 78PD, and the NAVCG 553. ALL of these are DD214 equivalents and perfectly, legally valid to establish your eligibility for veteran's benefits. You cannot get a DD214 per se, but Touchstone can provide you with a copy of your original separation documents. So, if someone asks you for your DD214, they are asking for your separation documents - using DD214 then only in the generic sense. The ever-growing problem of unsolicited and unwanted commercial emails has caused many web mail services (i.e. Gmail, Yahoo, Hotmail, etc.) and email applications (i.e. Outlook 2003/2007, Mozilla Thunderbird, etc.) to take measures to automatically filter bulk emails. Unfortunately, these filters end up blocking many legitimate newsletters and emails in addition to spam. Our client notices and case updates are not immune, and so these filters may incorrectly block our mailings, preventing the email you want to receive from us, from ever reaching your inbox. Your "whitelist" is your indication to your service provider or email application that you wish to receive email from certain specified sources. The method to whitelist us will vary by your Internet Service Provider and the program you use for your email. The most common way to whitelist an address is to add our return email address to your address book, white list, or safe list. There is no universal way to whitelist an address, so if this is not an option, you will have to consult the help section associated with your email application or your ISP's instructions. They should have instructions on how to whitelist an address there. We recommend that you take this simple step to help ensure that our mailings actually reach you. Even if you are currently receiving our mailings, we still advise you to follow this recommendation - to whitelist our return address - as a way to prevent future problems. There is no such thing as an automatic upgrade, and the process to upgrade is not an easy one. The form to commence the process is at DD Form 293. DD214s are not issued for those who perish during active duty. "A DD Form 214 will not be prepared for the following soldiers: (1) Whose active duty or FTNGD tour ends because of death or other reasons specified in AR 680-29." 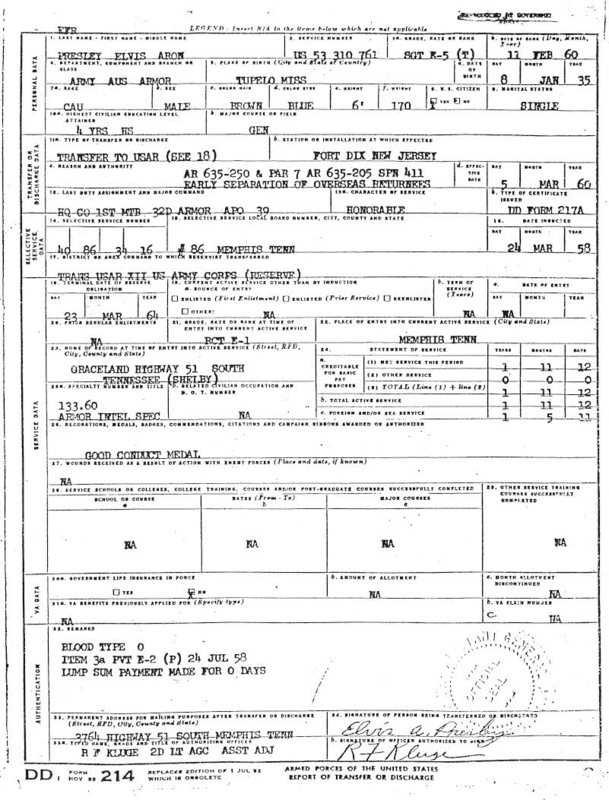 Source: http://www.dd214.us/reference/r635_5.pdf Military death certificates are produced on DD Form 1300, Report of Casualty. The family might also request his entire OMPF.